It doesn’t matter where in the world you live, an emergency plan for you and your family is an absolute necessity. From home fires to natural disasters and more, disaster preparedness can save your life. Call a family meeting, make a plan and implement it with the right supplies and then practice it. Emergency preparedness doesn’t just happen. It’s up to all of us. Hold a family meeting with everyone there. Attendance is mandatory and everyone must participate. Make older children with phones bring them to the meeting so you can enter the right information into contacts for them. Explain why you’ve called this meeting in a positive and encouraging fashion. Most children have experienced emergency planning at school. They do fire, earthquake and lockdown drills. There’s no reason to scare anyone in an emergency planning meeting but you do want to make sure everyone takes the potential risks seriously. Brainstorm as a family about what potential risks are. Some geographic areas like California are more prone to earthquakes while Florida has to worry about hurricanes. The Midwest must consider tornadoes. But natural disasters are just the tip of the potential emergencies. By encouraging everyone to come up with potential emergency scenarios you not only get everyone engaged, but you might get some insight to things your children worry about. Go through different scenarios to talk about the potential chaos that can happen without making a plan. Imagine if Grandma was watching the kids and fell down in the backyard unable to get up. Would your children be able to call for help? This isn’t a standard plan people think about when making an emergency plan, but is often far more likely than dealing with a home invader. Go through everyone’s contact list. Set a special contact for EMERGENCY CALLS. While your child will probably have you on the speed dial list, add others to this emergency call contact list. Order the list in a way that you child will go through the list in top priority. This means if they should call you first, you should be the first line. If they can’t get ahold of you, they should try Dad and then Grandma. Always keep emergency response phone numbers in the list too. This includes 9-1-1 and Poison Control (800.222.1222) and local schools and hospitals. It’s good for everyone to know the possible places family might shelter or be taken to if you cannot get in touch with each other. Some emergencies require that you hunker down and stay put. Other emergency situations require that you leave, often quickly. When that happens family members often get separated. A designated meeting spot is imperative. Situations where you have to hunker down often involve severe weather or law enforcement lockdown situations like an active shooter in the area. Don’t wait for a hurricane warning to prepare your home for a hunker down emergency. Make sure you have the right supplies including food and water to stay home for a minimum of three days if not several weeks or more. If you have to bug out, you won’t be able to take all those supplies with you. Especially fi you have to flee your home quickly. A bug out bag has the essentials to help you grab what you need and get out before becoming a victim. Everyone in the family should have a bug out bag. Don’t forget to plan for pets in emergency situations as well. When you have to move quickly, you need to be able to get what you need. Teach kids that family is more important that collecting their favorite toys. Buddies in the emergency plan are how you organize the escape. In a family of four, mom might be assigned to the younger child and dad the older since he more likely able to carry a bigger child longer. Do what is most comfortable for the family. The idea is that if a fire breaks out, everyone knows who is helping. Every child should know how to Stop Drop and Roll in case of fire. They should know how to touch the doorknob to see if it is hot and place blankets at the base of the door if there is a fire. Show them how to get out of a window if needed for emergency escape. We once lived in a house where my son (elementary school age) had a hard time lifting the window in his room. It was an old window that got stuck. We went through drills of how he would use a bat to break the window and his blankets to line the window if he needed to get out. Yes, I worried he would do a fire drill just to see if he could break the window. Never happened but I’d rather worry about that than him not being able to get out if I couldn’t get to him. Go through plans based on each type of disaster. These are just a couple examples. Teach kids exactly what to do and walk them through the escape plan or where to go to be safe. 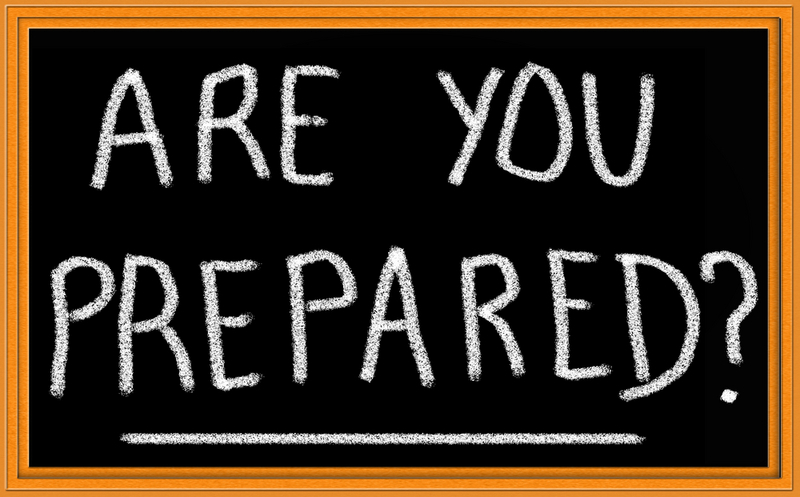 Emergency prep is a muscle that does best when exercised. Whether it is for your home extended hunker down supplies or a bug out bag, make a detailed list of what you will need. Even if you have time to prepare for an emergency like a hurricane, don’t expect stores to remain stocked for long. Plus prices start to skyrocket as supplies dwindle. Make your emergency kit early and keep it. Update it annually for expired items. For a more detailed emergency kit list, download out checklist here. Building your kits starts with the supplies for survival. Don’t forget about diapers for babies and essentials like clothing and shoes. If you leave in a hurry, you might be barefoot. A pair of shoes is imperative. Go through the emergency kit annually to refresh anything that might be expired. Food, medications and even water do expire. If anyone in the family is on medications, make sure you speak to a doctor or pharmacist to have a few extra weeks on hand in the kit. Place bug out bags near beds and exit points in the house. These need to be easily accessible for everyone, including kids. People don’t realize that water in a plastic bottle does expire. It begins to develop bacteria and can even leach plastic and toxins into the water from where it is stored in a garage or shed. This is why we endorse Blue Can Water. It has a 50-year shelf life and can be stored anywhere in hot or cold temperatures. It comes in an aluminum can which is also better for the environment. If you look at our emergency kits in the house, this is what we have. We also keep cans in the car and bug out bags to make sure we always have fresh water in an emergency. While these are a bit more expensive, it beats having to replenish our supply annually. Remember, these are good for 50 years (actually longer from what the tests showed, but we like to be conservative with emergency planning). We’ve said it already, emergency preparedness is a muscle. It needs to be practiced in order to keep things going smoothly in chaos. The stress of an emergency situation is enough to create confusion for anyone. If you practice with your family, everyone is better able to jump into action without having to think a lot about it. The more you prepare and double check plans, the safer your family will be. If you have any questions or need to customize an emergency kit, don’t hesitate to contact us. It’s what we do!